Maggie Björklund isn’t a household name. Despite the surname unfamiliarity (she’s Danish), the singer/pedal steel guitarist’s debut solo album Coming Home is drawn very much from a familiar source, wedding Maggie’s warm folksy style together with the contributions of musicians like Calexico, Mark Lanegan, and Jon Auer of the Posies. Maggie, though born and raised in Denmark, has nailed the wide open American West with her knockout pedal steel skills and resilient vocals. Coming Home is an album that straddles delirium and ecstasy, when the vultures circling overhead look like doves. Psychedelic desert pop music. It’s the sound of a bead of condensation rolling down a beer glass at a grimy cantina. It’s the sound of the glare off the windshield when you turn the ‘67 Caddy west. It’s the sound after the gunfight. 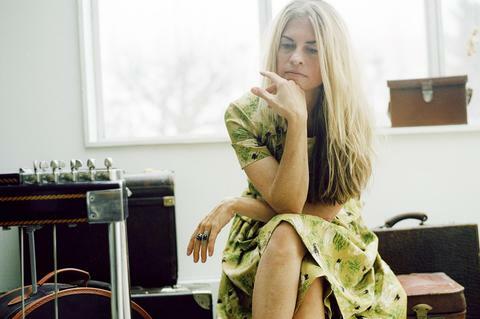 She soon arrived in Nashville, where she studied with pedal steel legend, Jeff Newman, and quickly found herself immersed in the Seattle music scene, working with fellow Bloodshot recording artist Mark Pickerel (Screaming Trees) and His Praying Hands and as a session player for producers Johnny Sangster and Steve Fisk. Maggie’s connection to Seattle led to her playing on many records for US artists, including Christy McWilson’s Martini Mansion, The Dept of Energy’s Faster, Mark Pickerel’s Cody’s Dream and Snake In the Radio and Rusty Willoughby’s Cobirds Unite. After spending years perfecting her skills on the pedal steel as a supporting player, Maggie decided it was time to write her own music again—so, in a way, Maggie’s solo album Coming Home is just that. Skin Yard, Screaming Trees), Pamelia Kurstin (theremin: David Byrne, Bela Fleck), Johnny Sangster, Barb Hunter (cello: Greg Dulli, Afghan Whigs, Mark Pickerel). Star) on “Vildspor” and “Playground Stars” and Rachel Flotard (Visqueen) on “Summer Romance” and “The Anchor Song,” as well as vocals from Maggie herself.